Our organization is engaged in manufacturing precision engineered Wind Turbine Ventilator. This equipment is used in the place of exhaust fans as their better substitutes. Basically, Wind Turbine Ventilators are designed to exhaust pollutants such as smoke, dust, humidity, fumes, poisonous gases and heat in various industries. It also helps in exhausting various invisible irritants from an enclosed area. Manufactured using premium grade metal and other requisite raw material, this equipment is in tandem with the international standards. Our equipment help in removing heat and industrial emission from a covered area and provide safe, healthier, cool and controlled environment that are suitable for the workers. 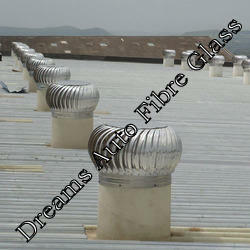 "Dreams Auto Fiberglass" was established in the year 2009. We are one of the leading manufacturer and supplier of Fiberglass Products that are widely appreciated for its high quality, high efficiency, adequate strength, longer service life and many other unbeatable features. Our impeccable range of products comprises of FRP Sheets, FRP Roof Sheets, Polycarbonate Shed, Roof Turbine Ventilators, Air Ventilators, Roof Turbine Air Ventilator, Roof Air Ventilators, FRP Canopy etc. We ensure that our products are manufactured as per the set industrial norms and procedures. We try to offer our clients a range that is unmatched in terms of quality and functionality. We make use of cutting edge technology for our products such that they match the international quality standards. This further ensures that our customers get products that are at par with the latest market trends. We offer our products at competitive prices. Our quality controllers conduct several tests on each and every product on various quality parameters such that our clients can receive from us a flawless range. Our team leaves no stone unturned to ensure high quality range of products that matches our customer?s expectations and help us achieve total client satisfaction. Further we also see to it that all the products are packed properly such that they remain safe and do not get damaged during transit. We also offer customized packaging facility to our customers. With our world class infrastructural facilities and support of a dexterous team of professionals, we have been accredited by the certification of British Standard Bureau of Indian Standard. Thus with our ability to offer high quality range of products, timely delivery, customization, affordable pricing and following ethical principles, we have succeeded in carving a niche for ourselves in the market.